Selling or Buying a Maserati? Established in 1914, the Italian manufacturer Maserati has been building luxurious sport cars with gorgeous designs and exciting performance for decades. The brand started by making racecars, which were quite successful. The Maserati 8CTF won the Indianapolis 500 and the Maserati 250F won the world championship in 1957. The Maserati A6 was one of the first road models launched in 1947 and was followed by models like the Maserati 3500, the Maserati Sebring, the Maserati Mistral, the first four-door Maserati Quattroporte in 1963 and the two-seat Ghibli in 1967. 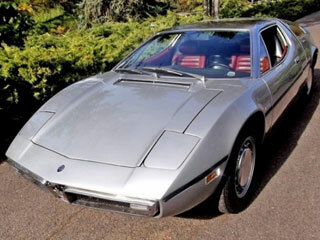 After the brand’s takeover by the French car manufacturer Citron, the front-engined Maserati Indy was introduced in 1969, followed by the GT Maserati Vignale, the Maserati Bora, the Maserati Merak, and the Maserati Khamsin. FIAT acquired Maserati in 1993 and the brand launched the powerful 3200 GT in 1998, which then gave way to the modern GranTurismo and GranCabrio. Looking to purchase a classic Maserati? The trident logo of Maserati was designed by one of the Maserati brothers, and inspired by the fountain of Neptune in Bologna, Italy. The statue of Neptune is a characteristic symbol of Bologna, which is the company’s original hometown, and Neptune represents strength and vigor, which are values that the company carried out. Maserati built some of the most refined and iconic classic cars of the era. Owning a classic Maserati is a privilege and a very special experience. The brand’s incredible history and prestige contributed to making many models famous. Maserati did not produce high volumes, especially in the early days, which makes classic Maserati models quite rare. Although some will say that no Maserati is reliable, you will come across models are well maintained and will give you unmatched driving enjoyment. It is always recommended to purchase the vehicle that is in the best condition, within your budget, in order to save you time and money down the road. Be sure to connect with The Beverly Hills Car Club team soon if you are thinking about buying a classic Maserati, no matter what model or in what condition. The Los Angeles classic car dealership experts are ready to assist you and would be delighted to help you make a smart purchase. Give them a call now to discuss your project! We Also Buy Classic Maseratis In Any Condition, Top Dollar Paid. And We Pick Up Anywhere In The USA.